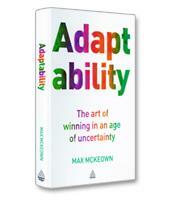 Max McKeown's new book harnesses the essence of human survival — the ability to adapt — to help people succeed in business and all other aspects of life. He draws on millions of years of evolution to create a practical and strategic set of rules that take adaption from an involuntary coping strategy to a deliberate winning strategy. Adaptability proves that innovation is important but not enough. The ability to adapt smarter and faster than the situation changes is what makes the powerful difference between adapting to cope and adapting to win. Why some groups adapt better to uncertainty. How to be inspired by stories of successful adaptation. How to transcend the constraints of your situation. Why "adapt or die" is not the only choice. What the rules of adaptability are.